It is amazing in this era of ‘modern’ arboriculture how little we really know about life below ground in the soil within which the tree grows. 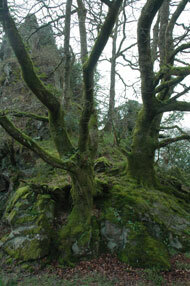 The tree we see above ground level is merely the tip of the arboreal iceberg, and without roots there would be no tree. The techniques we use to treat the tree above ground are only really ever remedial, in that all they do is reduce or remove the symptoms of health problems that are often hidden in the soil from which the tree grows. How much we still have to learn! Welcome to a new age of arboriculture which will explore the life support of trees in the arboreal world below ground level. This website promotes the commercial use of a specialist excavation technique using compressed air to reveal the roots of trees like never before. The AirKnife is one of several tools that have been used in America for several years, but have only recently been imported to the UK, which utilise compressed air to literally blow the soil away to expose tree roots without damage. However, the most important use of the techniques promoted here, is in the contribution it will have to our knowledge of arboriculture and what keeps the tree alive. The experience gained through our work with tree roots is recorded as part of a long-term research project to further our understanding about roots and their interaction with the soil in which they grow. The term ‘Rhizosphere’, from which this site takes it’s name, is “the zone surrounding fine, absorbing roots, in which the soil micro-organisms are affected by the roots, and by substances coming out of the root. “The microenvironment of absorbing roots.” A new tree biology dictionary – Alex L. Shigo 1986. However, we are just as concerned with the formation of the tree’s root system as a whole. Read more about how the AirKnife works an idea of where it can be used: what is the AirKnife, construction sites, pipeline trenching, tree health investigations, remedial mulching and our tree root research.